Army troops of the Red Horn Division of Gajraj Corps carried out a Joint operation along with Assam Police, busted a terrorist Hideout of Hynnietrep National Liberation Council (HNLC), and apprehended Five HNLC cadres in West Karbi Anglong district of Assam on Tuesday. 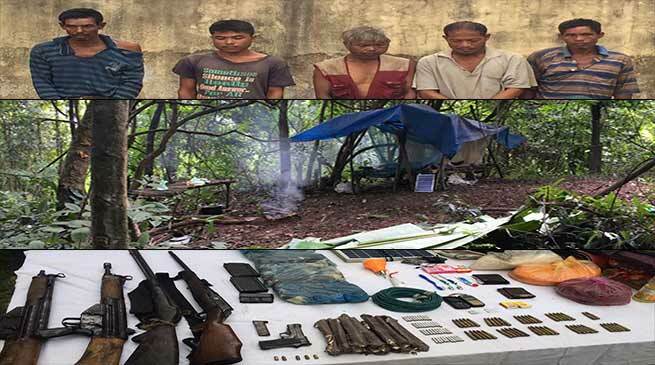 The cadres also revealed the location of a hideout in jungle near the Assam-Meghalya​ border, where cache of weapons, ammunition & explosives were hidden. The joint operation team searched the jungle​ in the morning of 19 Sep and busted a hideout deep inside. Huge cache comprising two G3 Rifles, one 303 Rifle(Factory Made), one 7.62 mm Pistol (Factory Made), one Single Barrel Gun (Factory Made), 10 Kg Explosive, 40 Detonators, 66 Live Rds and other warlike stores were recovered. It may be recalled that two days back Army Troops from the same formation had conducted a similarly successful operation in the East Karbi Anglong District, where another terrorist hideout of Kuki Liberation Front had been busted and a Senior functionary of the group was apprehended with arms and ammunition.